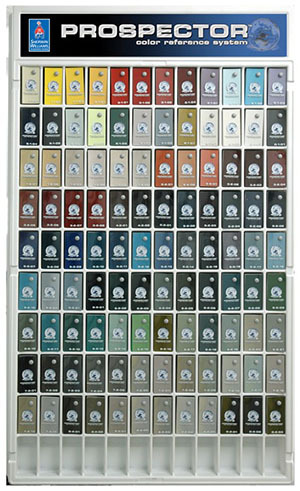 The PROSPECTOR® Color Reference System is a chromatically arranged color chip system designed to reduce the amount of time that users spend identifying and selecting colors. The PROSPECTOR® system is made up of chips that are sprayed using AWX™ Performance Plus paint. When users select a chip from the PROSPECTOR® Color Reference System they can see the actual color that they will be spraying before they spray it. The system contains over 7,800 sprayed chips arranged into 120 hand-held fan decks and can be used for matching solid and effect/metallic colors. Large chip size allows for easy identification to the vehicle. Colors in the system represent OEM standard colors and popular variants for the top car manufacturers from around the globe. Each chip represents a color that is on the road today. The chromatic design allows users to quickly color match vehicles even when the paint code is not know.